As previously reported, Thierry Mugler has released a set of perfumes in conjunction with the recent European release of the movie version of Patrick Suskind's Perfume. 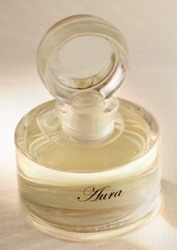 The scents were developed over a period of 6 years by Christoph Hornetz and perfumer Christophe Laudamiel, and include Aura, Baby, Paris 1738, Atelier Grimal, Virgin Number One, Boutique Baldini, Amor & Psyche, Nuit Napolitaine, Ermite, Salon Rouge, Human Existence, Absolu Jasmin, Sea, Noblesse and Orgie. For more information about each fragrance, visit the Le Parfum website (link no longer active, sorry! ), which will begin selling to customers in the United States next month. At that time, presumably there will be English translations; for now, your choices are French or German. I'm in the midst of this wonderful book, and boy would I love to get my hands on that set to sniff while I read! Will Aura only be available over the web or is it set for retail release? It sounds like they're still making plans for Aura, no date set, and no idea where they'll sell it — but if they do a separate release, I'd be surprised if it was web only. This sounds fascinating. I can't afford the coffret (who could?) but I might very well spring for Aura. And I can't wait to see how they translate the book onto film (it seems as if it would be impossible, but the initial notices are quite good). I can't afford it either, but I understand it sold out in France & Germany so I guess *somebody* can, even if it isn't you or me. Do check out Marcello's review of the Perfume movie! So exactly how much IS this coffret? I can't find info – but also the french website won't load for me. Sounds fascinating. I have not yet read this book but should probably get on that now – when is the movie coming out? I heard the coffret is $700, and the movie comes out on December 27. Harrods has it for 380 pounds, and I think the price in Euros is 500, so $700 sounds about right.